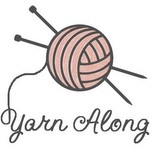 Ravelry, if you've never been, is a great place for community, conversation, and- of course- yarn. Several of my favorite discussion boards share patterns and host swaps, but as it is January, a popular one is the Cold Sheep (and Friends) group. Now, you may ask, what is a cold sheep? Basically, it's a crafter's term for not buying any yarn. Every once in a great while (for some of us, more frequently), crafters realize that they have purchased more yarn then they could ever use up in their lives-- this is called SABLE (stash acquired beyond life expectancy). The Cold Sheep group exists to motivate crafters to knit and crochet and spin and weave their yarn into useful/beautiful/warm items. The group runs little challenges throughout the year- some with prizes, some without- to help its members to think outside the box when working with their stash. My favorite is the You Can Do It! CSAL, which tracks participant's yardage output over a period of time- in this case, three months. For every 1000 yards you use up, you earn an entry into their prize drawing. I find that the motivation from getting a prize entry can help me finish languishing projects. Who doesn't love motivational sheep? 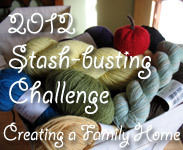 Another group that is helpful for "stashing down" is the KnitPicks (and more!) Stashdown group. Similarly structured to the Cold Sheep group, challenges to use up yarn and motivate crafters to have manageable stashes abound. This year, they are doing 2 big challenges- a "no yarn" tiara and a "weight loss" tiara. I joined in on the "weight loss" one, because moving 6000g out of my stash would be amazing-- and it also allows for some freedom in purchasing new yarn if needed. Of course, the crowns are virtual, but in addition to the larger, year-long challenge, various group members have smaller, shorter challenges that may have real-world prizes. As it is January, and many people make resolutions, these groups could be useful for crafters. I am finding them useful for me, as I am taking this year to reorder my stash and put it into a more manageable, useable space. Avoiding aimless purchases is the first part, using the yarn is the second.